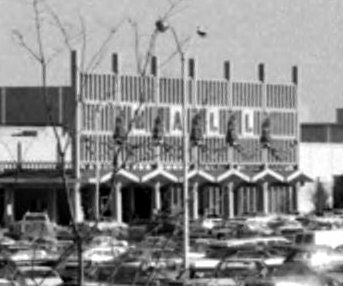 Retro Retail Video - "Buying Food"
In '76 I was still being carted to this mall (just a couple miles from my house then) by mom and dad, but in a few years I'd be old enough to at least be able to get dropped off and left there (which was key!) with my friends, to hang out, look at record albums, buy frozen cokes, and flirt with girls--though not necessarily in that order. So yeah, I sat around that main entrance there (inside and out) having a lot of youthful fun, many a day and evening, as a teen. And those were certainly the days, as well as some great memories. Hey, this mall has its own blog! I find it interesting the mall is two levels near Penney's. Clearly an addition. Wish I could see inside! I would love to hear more about your memories of this mall, Keith, especially about the decor and the stores back in '76. Looks like a neat mall, Keith. I have never been to any Michigan malls (I'm originally from neighboring Ohio), but I certainly share your nostalgia for the "good ole mall days". My biggest nostalgic mall memories center around DAYTON MALL (south of...you guessed it....Dayton, Ohio). My first visit there was in 1969, when construction of the "super-regional", 120 store, shopping center was nearing completion. Up to this time, I had never even HEARD of a "shopping mall" (altho there were, by 1969, six -more or less- major malls in the Cin-Day area). It should be illegal for mall and retail management to treat their history so shabbily. Scott: That "blog" is rarely updated and appears to be more of a seasonal type of deal so far--they posted an item in the summer (June), and now they have a Fall message. If there was more to it and if it was updated regularly, I would have made mention of it a while ago, because I thought the idea was kind of cool, too, when I first saw it. It's just that there's nothing there really. No content. As for Oakland Mall being two levels near Penney's--this wasn't an addition. Been that way since the start. The Sears anchor on the East side of the mall is two levels as well. It, too, has been that way since the beginning (I have a few aerials from around the time they opened which also show this). That whole West wing becomes two levels outside of Penney's, with multiple stores on top and below through there. So it's the two anchor sides that are both two levels, and in the mall proper, it's all one. As for interior photos, stay tuned. They're in the pipe! Didi: You'll hear more from me on that stuff. Better yet, you'll see it soon. 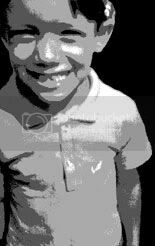 :) Would that I just had more free time!! Cuz I could go on forever about my local malls (and lots of the others I post here, too, actually), if I just had more time. Which is why I have to keep my entries rather short on this blog for the most part. Anonymous: I've got some Dayton Mall material. I'll try to post something for you soon. Thanks for the great memories you shared there! 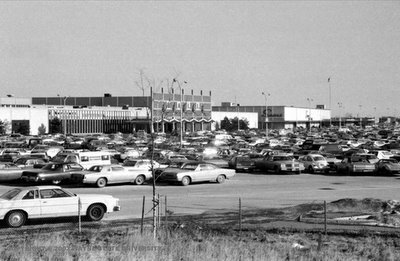 The JCPenney and the two-level portion of the Mall that approaches it WERE additions, around 1977/78. Originally, that North branch of the mall housed only a Wrigley's grocery store, which was torn down to make way for the addition. Oakland was originally only a two-anchor mall (with a Wrigley's and a Kresge's thrown in). Does anyone remember the concrete hippo that stood just East of Hudson's, in front of Van Horn's and Winkleman's (now combined as Border's) next to the long-gone fountain? We weren't allowed to play on that hippo BECAUSE IT WAS DANGEROUS, and then my friend's sister broker her tooth sliding down the hippo, so the mall added carpeting under the hippo. Anyway, that very hippo now resides at the entrance of the Detroit Zoo, you know, if you're ever in the area and want to visit the hippo, that's where he (or she) is, anyway, at the zoo. Well shiver me timbers. I was under the impression the second level Penney's stuff had always been there. Coincidentally, I just had a conversation about that with someone a few months ago and they believed it was always there too. At any rate, thanks Anonymous #2! Gotta figure out what the heck I'm seeing on my old aerials now, though! Looked like it was already there. Boy do I sure remember shopping there with my parents as a kid, then driving there when I got my license. I grew up at Hampton @ Rochester road and Auburn road. i love that mall. i used to go with my grandmom when i was a kid. i also skipped school with my teacher and road in his corvette to see 2001-a space oddessy at oakland. being from downriver, it was worth the trip everytime! I grew up in the area and can remember the mall before the JC Penney wing was added - so I can confirm that it was an addition. To me, the best feature of Oakland Mall was the Hudson's restaurant that was on the 2nd floor balcony overlooking the rest of the mall. However, I haven't been there in 6 years. Does anyone know if the balcony restaurant is still there? Keith, I really can't wait to see what you have on DAYTON MALL. When you post this stuff, I suppose that I will -then- take us (or anyone else reading the postings) on a trip down MALL MEMORY LANE, circa 1969. I was at "The Mall" (as my family called it) a LOT between '69 and '72. I can remember quite a bit. BTW, I keep seeing the term "Classic Mall Era". I am presuming that this began with the opening of Seattle's NORTHGATE in 1950......and ended when? (I would imagine, in 1970 or '75?). I am thinking that DAYTON MALL came along toward the end of this era? I am also looking forward to seeing the Dayton Mall photos. I have lived in the Dayton Mall area all my life (born in 1968), and I have fond memories of the 1970's Dayton Mall. My family didn't go to the Mall often when I was little, so it was a big deal for us kids when we did go there. I can still recall the main entrance of the Mall and the coins in the indoor fountains. I'm a resident of Troy and have always loved Oakland Mall. It doesnt get the love it deserves because of the ultra-lux and much newer Somerset Collection which is also in Troy. Oakland has sorta become an embodiment of the Chris Rock joke that goes along the lines of "Every city has two malls, the one the white people go to, and the mall the white people USED to go to". Otherwise, it's a great mall in the way I like to think of a mall. I DO remember the hippo mentioned, didnt know it ended up at the zoo. I really miss the big original mall sign at the corner of 14 and John R, that thing was so gawdy but you dont appriciate it till it's gone (like the lighted signs from old Vegas). Maybe my favorite memory of Oakland was in the early 90's, there was a thief that would hide under cars in the parking lot during the holidays and jump people. Until the late 90's my mom would still warn me to look under my car if I ever went to the mall. LOL. I also grew up going to the Oakland Mall -- when I was old enough, my friends and I would ride our bikes there in the summer. I remember when the two-level addition was being built -- it really changed the mall. There is a Facebook group devoted to the Oakland Mall. I too grew up around Oakland Mall. I'm 44 now and I remember buying my first drumset at Grinnell's (circa 1975 or 76). Which was the first store on the right as you exited Sears heading into the mall. I also remember eating at York Steak House. Where the present food court now sits. I remember when the grocery store closed. It was, for a brief while, a toy store before they tore it down to make way for the two-story addition in 1980. In the early 70's, Oakland Mall used to have tiled "gutters" that water ran through in front of the stores. We rarely ate at the Hudson's Restaurant, but I always loved looking down at the fountain and the hippo. Usually we had tuna sandwiches and hot fudge sundaes at Sanders. We'd often browse B. Dalton's next to Sanders while waiting for a table. Desperately looking for a shot of the "other" mall in that area, Universal City, and its tiled mosaic of Saturn and the Milky Way, circa 1976... Anyone? Universal Mall was a couple of miles away, but never got as grand as Oakland Mall. The original Mall had Hudson's and Sears as its original anchor stores. The bi-level area was an addition that came in the late '70s. I remember a toy store was originally there. 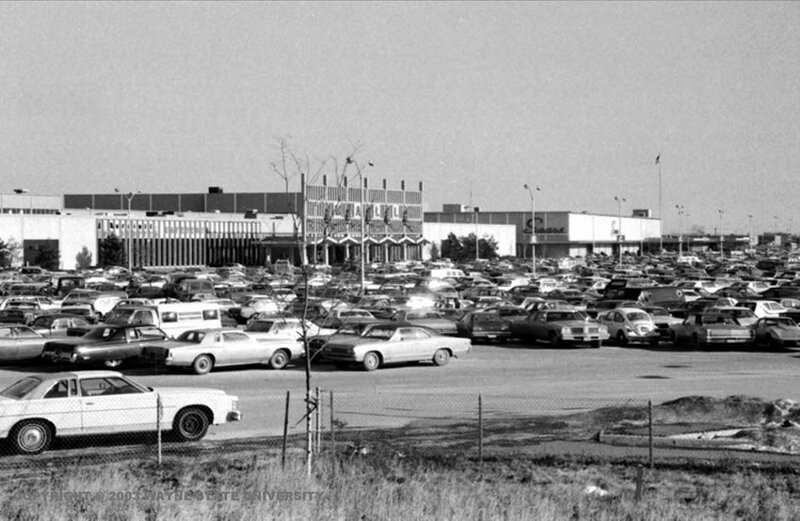 Then they tore it down and expanded the Mall, which eventually included the multiplex and JC Penny's. I remember always going to York's steakhouse with my great grandfather and the spaceship that was in an arcade back in the early early 80s.